These heaters use an ITR Patented vaporizing burner and are controlled by a fully adjustable fuel regulator. The heat output can be adjusted from 10,000 BTU/h to 30,000 BTU/h (approx. 1 liter per/hr fuel consumption on high) (0.3 US gal/hr). The Expedition Diesel Space Heater delivers the ultimate in clean, efficient heat and requires no electricity. A diesel fuelled heater means low maintenance, simple to light and operate, with no chopping wood or hauling heavy propane cylinders as with other types of heaters. On low, a 20 liter jerry can will last 25 hours on readily available diesel fuel. The Expedition space heater will keep you warm and comfortable in your insulated wall tent, cabin, garage, or workshop or where-ever you need portable or emergency heat. The Expedition also incorporates multiple operational safety features, a patented non-flooding burner, fuel regulator with overheat protection, and a manual fuel shutoff valve. A stainless heat shield is attached to the heater to protect the user from incidental contact. 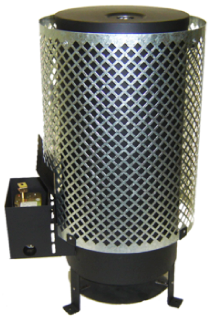 These non-powered diesel space heaters are being used in mining camps, construction sites, wall tents, agricultural buildings, homes, cottages, workshops and garages, ice fishing shacks, hunting and outfitting operations, emergency shelters.